The Saddle Club is a hugely popular series for girls aged 9 – 12. In its new format of two stories per book, young readers will fully immerse themselves in all things horsey. The series follows the lives of three girls on the cusp of adolescence: Carole (obsessed with horses), Stevie (tom-boy and practical joker) and Lisa (loves school and learning). They make an awesome team as their love of horse riding at their beloved Pine Hollow Stables brings them together to form The Saddle Club. Throughout the series, readers follow these three girls, plus many extra characters, through adventures, rivalry, gymkhanas, friendship problems and family dramas. There are some tough issues and personal obstacles, but through teamwork and loyalty, the girls’ bond of friendship grows even stronger. At the conjunction of both stories, there’s an interesting segue into the reality of the horse world, with a short piece about how horses took part in the Olympics 2700 years ago, as well as interesting facts about show jumping and dressage. Stevie has a problem. Her parents won’t pay her fees to attend the Mountain Trail Overnight Camp unless her grades improve. Studying seems too hard for Stevie so she decides instead to do odd jobs and earn the money herself. That is until things start to go wrong. It is Lisa who comes up with the compromise that has been in front of their eyes all along. Meanwhile, Lisa, who is new to the stables, has parent problems. 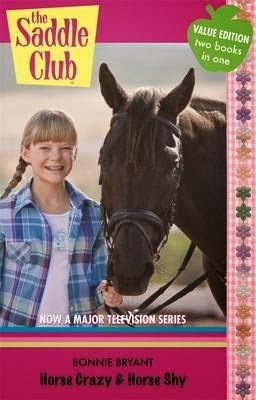 She’s doesn’t want to be a rider, it’s her mother’s ambition, but ‘Lisa knew that once again, she would just do what her parents wanted her to do.’ All Lisa really wants is to ‘escape into her homework.’ When Carole’s favourite horse, Cobalt, has to be put down, she retreats into herself as her own story of the loss of her mother weaves through. Carole becomes horse shy and doesn’t want to ride any more, until she gains her emotional strength from her best friends. The joy of these stories is that you don’t have to own a horse, or even go horse riding. Through the descriptions and horse vocabulary such as: tack rooms, bridles, grooming, saddle soap, breeches and phrases like ‘rise and sit with the beat of the horse’s hooves’ young readers can connect to the world of The Saddle Club. And if the opportunity to go horse riding comes about; readers will be off with a flying start.